In 1517 a relatively unknown monk and professor residing in a small town in Germany started a social and religious movement that forever changed Europe and the rest of the world. Martin Luther called for reforms in the Western Church by posting his Ninety-Five Theses on the doors of the Castle Church in Wittenberg, Germany. Thanks to the recently created printing press, pamphlets and broadsheets reproducing Luther’s ideas for reform quickly spread throughout Germany and Europe. In today’s parlance, his message went viral. 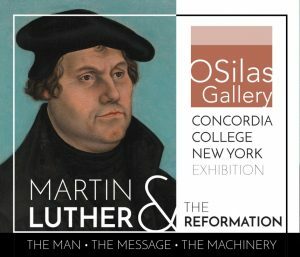 This exhibition explores who Luther was, what he stood for and how innovations in printing enabled his ideas for reform to spread rapidly in the 1500s. The Gallery will also be closed on the following dates: September 22 & 23 and October 14. To arrange a group tour outside of normal gallery hours, please contact Executive Director Elizabeth Vranka at 914.337.9300×2173.